Zone IP and Zone Law will be closed for business on Friday 14 April 2017 through till Monday 17 April 2017 for Easter Weekend. We will be open normal business hours from Tuesday 18 April 2017. We are also closed on Tuesday 25 April 2017 for Anzac Day, reopening the following working day. Our websites and online platform will still be available during these public holiday periods. Please note, the New Zealand Intellectual Property Office is also closed over these public holiday periods. INTA (International Trade Mark Association) will be held in Barcelona, Spain in May this year. The Zone IP and Zone Law team are delighted to be attending this Annual Conference. The team will be hosting a Cocktail Function at this year’s event and will look forward to catching up with clients and associates from around the world. 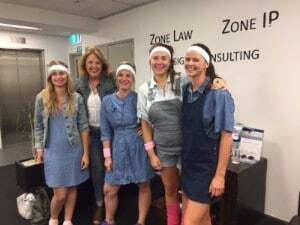 On Friday 3rd March some of our team at Zone played in a Jumbo Tennis Fundraiser Competition. Money raised went towards three different Wellington Charities. Although we didn’t win it was fun getting dressed up as a team and we all had a great day.